When asked about the Bel­gium artist Frans Masereel, the two thoughts that imme­di­ate­ly come to mind are wood­cuts and war. I do not know an artist who was so wed­ded to the wood­cut in express­ing his loathing of war. Although this theme pre­vailed in many of his books, an exam­i­na­tion of his wood­cuts in Debout Les morts (Arise Ye Dead, 1917) as reprint­ed in this issue of THE REVELATOR, pro­vides a vital con­nec­tion to his sub­se­quent anti-war books; and there were many, as we will dis­cov­er. I can still remem­ber the Boer War, which made a great impres­sion on me. How old was I then? Ten or twelve, per­haps thir­teen? It was at that time that I began to make draw­ings, children’s draw­ings, of course, that were against the war, and ever since, I believe that I have always remained very anti-war (Aver­maete, 17). He stud­ied at the Acad­e­mie of Arts in Ghent in 1907 where he met Jules de Bruy­ck­er, who Masereel declared “taught him to see and to draw” (14). He left school after a year and a half and trav­elled to Paris and Brit­tany where he con­tin­ued to draw and paint. It was dur­ing this time that he sub­mit­ted draw­ings to the satir­i­cal mag­a­zine L’Assiette au beurre, pub­lished by Hen­ri Guil­beaux, who became a last­ing friend of Masereel. The qual­i­ty of Masereel’s ear­ly anti-war draw­ings from 1914 – 15 are dis­played in his illus­tra­tions to La Grand Guerre Par Les Artistes by G. Gef­froy and La Bel­gigue Envahie by Roland De Marés that depict Bel­gium refugees dur­ing the war with extreme emo­tion in the expres­sions of the char­ac­ters. He’s an ath­let­ic fel­low, with a black beard and glass­es; he is reserved, like a Spaniard, and one could take him for one. He is in fact, Flem­ish, from Ghent, and he is twen­ty-eight, but he looks at least thir­ty-five. He is very like­able, and cer­tain­ly very kind, inca­pable of the slight­est pet­ti­ness. The present spec­ta­cle is incom­pre­hen­si­ble to him, and fills him with hor­ror (18). Masereel joined this group and worked as a trans­la­tor for the Inter­na­tion­al Red Cross. and draw­ings to the news­pa­per La Feuille, 1917 – 1920, where he mas­tered a method using brush and ink to cre­ate a sin­gle anti-war draw­ing relat­ed to the news of the day while meet­ing a dai­ly pub­li­ca­tion dead­line. He learned to incor­po­rate exag­ger­at­ed ges­tures and emo­tions in these draw­ings, which is a device used in car­toons that Masereel would ful­ly devel­op dur­ing his time at La Feuille and mas­ter in his wood­cut nov­els, ear­ly exam­ples of today’s word­less graph­ic nov­el. A selec­tion of forty-eight draw­ings from this exten­sive col­lec­tion was pub­lished in 1920 under the title Poli­tis­che Zeich­nun­gen. Dur­ing the three years that he worked at La Feuille, he cre­at­ed over 1,400 draw­ings. Over this peri­od of time, his focus on the war changed in his wood­cuts and draw­ings; and “…in them he would typ­i­cal­ly jux­ta­pose the pro­nounce­ments of a politi­cian or indus­tri­al­ist with a scene of bat­tle­field car­nage, and in doing so showed the vast gulf between the offi­cial rhetoric of the war and the real­i­ty” (Wil­lett, 111). Masereel con­tin­ued to work with the wood­cut, became more assured of his skill, and pub­lished fifty-sev­en wood­cuts in Quinze Poèmes by Emile Ver­haeren in 1917. An exam­i­na­tion of these ear­ly efforts reveals a tra­di­tion­al approach in the medi­um. His char­ac­ters are stiff and the engrav­ing seems restrained. 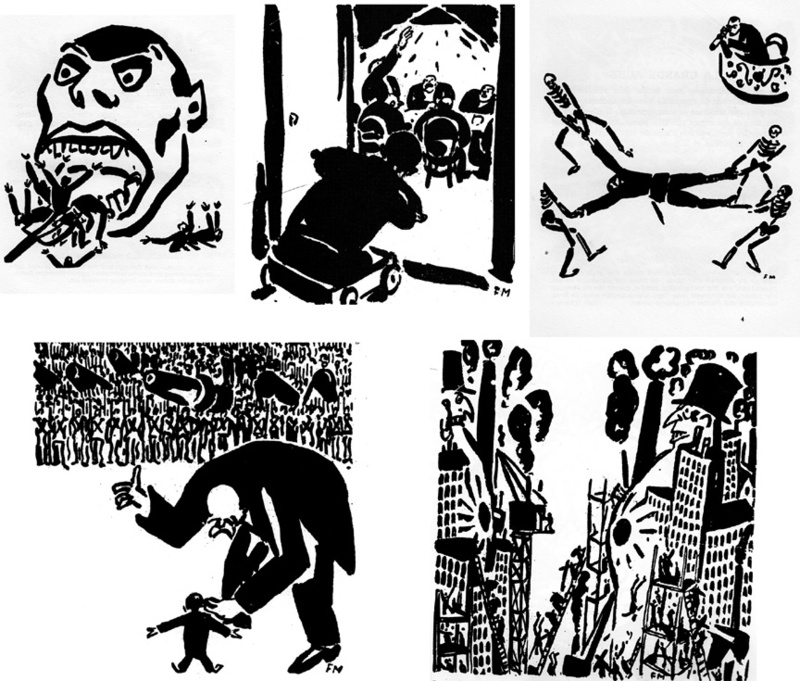 Many of these ear­ly wood­cuts have none of the defin­ing ele­ments of Masereel’s rec­og­nized style. It is the brush and ink draw­ings that he cre­at­ed for La Feuille that released him from this rigid style. All artists try on dif­fer­ent hats dur­ing their devel­op­ment as artists. It is to Masereel’s cred­it that he chose to aban­don a tra­di­tion­al style for one that was free flow­ing and visu­al­ly inspir­ing, one that sup­port­ed his call­ing as an artist whose “…pri­ma­ry pas­sion and com­mit­ment was humankind itself: a bound­less sol­i­dar­i­ty with his fel­low-crea­tures” (Engel, 9). It was dur­ing this trans­for­ma­tion that Masereel found an inim­itable style that he would extend into a sub­stan­tial body of work, which began with his first word­less book of ten wood­cuts in Debout Les morts (Arise Ye Dead). Like his work in La Feuille, in this folio he dis­played the hor­rors of World War I not only in the trench­es but also in those expe­ri­ences of women and chil­dren in a mix of bizarre fan­ta­sy and sur­re­al dis­plays. He does not hes­i­tate to por­tray the grue­some­ness of war on the title page, with a half page wood­cut of men with­out limbs, which is car­ried through to a print with more sol­diers cut in half or crawl­ing on the ground as their entrails spill out of their stom­achs. 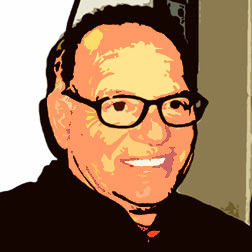 His use of Chris­t­ian sym­bol­ism appears on the first full page with an image of the cru­ci­fix­ion, com­mon­ly sym­bol­iz­ing suf­fer­ing and sal­va­tion. The suf­fer­ing is pre­sent­ed in the fore­ground with a man, his hands bound, show­ing an expres­sion of pain while the sym­bol of sal­va­tion is in the dis­tant back­ground, behind the man who is unable to see or reach for any promised redemp­tion. In three oth­er scenes of death in the trench­es, sol­ders rot in barb­wire fences that have wrapped around their bod­ies and appear like wood­en posts. Oth­er prints dis­play sol­diers gouged on sharp­ened wood­en stakes or scream­ing in ter­ror as they are burned alive in a human bon­fire. One can only imag­ine the sounds of wail­ing and unimag­in­able pain depict­ed in these wood­cuts. In two oth­er prints, an anchor, a sym­bol of hope, holds a moth­er down in a ris­ing tide rather than offer­ing sal­va­tion. She clutch­es the hand of her drowned child at her side, des­per­ate­ly rais­es her oth­er hand in sup­pli­ca­tion, and bends her head back as far as pos­si­ble to keep from drown­ing. Her dress has shame­less­ly risen above her thighs as she impas­sive­ly pre­pares her­self for death. In a sur­re­al­is­tic and car­toon-like dis­play, Mas­reel presents two head­less sol­diers car­ry­ing the heads of two oppos­ing sol­diers on a stretch­er as they march across a stark field. In the final selec­tion of prints, a skele­ton storms out of a crypt as a indus­tri­al­ist races away from the grave and a woman is assault­ed by a skele­ton — both using per­son­i­fi­ca­tions of Death that Masereel used exten­sive­ly in La Feuille and in many of his oth­er works. His use of white space, in con­trast to the strong black ink in his wood­cuts present endur­ing images that shake up one’s visu­al sen­si­bil­i­ties like no oth­er artist. In the same year, he pub­lished anoth­er book of prints, Les Morts Par­lent (The Dead Speak, 1917) that dra­mat­i­cal­ly incor­po­rat­ed this per­son­i­fi­ca­tion of Death. In addi­tion, Masereel illus­trat­ed nine books pre­dom­i­nant­ly in wood­cuts from 1918 – 1920 with his dis­turb­ing focus on death and the wreck­age of war. The end of the World War I left lit­tle time for cel­e­bra­tion before the rise of Fas­cism. Masereel once again used his graph­ic skills to record the atroc­i­ties of anoth­er world war in poignant word­less nov­els like Danse Macabre (1941); Juin 40 (1942); Des­tins 1939−1940−1941−1942 (1943); La Terre sous le signe de sat­urne (1944); La Colère (1946); Remem­ber! (1946); and numer­ous book illus­tra­tions by var­i­ous authors on the slaugh­ters and geno­cide from 1935 – 46. In his [Masereel] late work, espe­cial­ly that dur­ing World War II, you will find vir­tu­al­ly every con­test­ed polit­i­cal and moral theme any writer or thinker has iden­ti­fied about the war, its aim, its moral­i­ty (Bruck­n­er, 57). The threat of nuclear war against the back­drop of a ris­ing tech­no­log­i­cal and mate­ri­al­is­tic zeal lead Masereel to exam­ine the pre­dictable destruc­tion of the human race. He explored our return to a more com­pas­sion­ate and prim­i­tive lifestyle in word­less books from 1949 -1966 includ­ing Ecce Homo (1949); Notre Temps (1952); Die Apoka­lypse unser­er Zeit (1953); and Pour quio? (1954). Ulti­mate­ly, his stun­ning wood­cut illus­tra­tions to Johannes R. Bech­er lyri­cal work Vom Ver­fall zum Tri­umph (From Decay to Tri­umph, 1961) is per­haps Masereel’s clos­ing mes­sage of hope to our war­ring world, pre­sent­ed in a high­ly sym­bol­ic style and packed with icon­ic lan­guage that begs inter­pre­ta­tion. Aver­maete, Roger. Frans Masereel. Lon­don: Thames and Hud­son, 1977. Print. Bruck­n­er, D J. R, Sey­mour Chwast, and Steven Heller. Art against War: 400 Years of Protest in Art. New York: Abbeville Press, 1984. Print. Engel, Wal­ter. “The World of Frans Masereel.” Trib­ute: Frans Masereel, an Exhi­bi­tion of Paint­ings, Water­colours, and Graph­ics, Sep­tem­ber 13-Octo­ber 25, 1981, Art Gallery of Wind­sor. Wind­sor, Ont., Cana­da: The Gallery, 1981. 9 – 86. Print. Wil­lett, Per­ry. “The Cut­ting Edge of Ger­man Expres­sion­ism: The Wood­cut Nov­el of Frans Masereel and Its Influ­ences.” A Com­pan­ion to the Lit­er­a­ture of Ger­man Expres­sion­ism. Ed. Neil H. Don­ahue. Rochester, N.Y: Cam­den House, 2005. 111 – 134. Print. Fig 1. Frans Masereel. 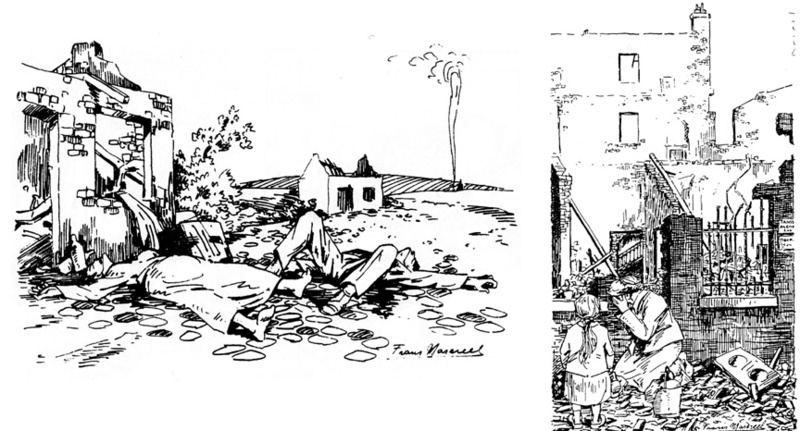 Illus­tra­tion for La Grand Guerre Par Les Artistes by G. Gef­froy, 1914 – 1915. Fig 2. Frans Masereel. Illus­tra­tion for La Bel­gigue Envahie by Roland De Marés, 1915. Fig 3. Frans Masereel. Demain, 1916. Fig 4. Frans Masereel. Les Tablettes, August, 1917. Fig 5. Frans Masereel. La Feuille, May 28, 1918. Fig 6. Frans Masereel. La Feuille, Feb­ru­ary 25, 1918. Fig 7. Frans Masereel. La Feuille, June 20, 1918. Fig 8. Frans Masereel. La Feuille, Jan­u­ary 27, 1919. Fig 9. Frans Masereel. La Feuille, Octo­ber 21, 1919. David A. Beronä is a his­to­ri­an of the wood­cut nov­el and word­less comics. He is the author of Word­less Books: The Orig­i­nal Graph­ic Nov­els (2008) — with edi­tions in French and Kore­an, a win­ner at the New York Book Show, and a Har­vey Awards nom­i­nee. He has pub­lished and pre­sent­ed papers wide­ly on these top­ics with essays in Crit­i­cal Approach­es to Comics: The­o­ry and Meth­ods (2011) and The Lan­guage of Comics: Word and Image (2001). He select­ed and edit­ed Alas­tair Draw­ings and Illus­tra­tions (2011) and Eric Gill’s Mas­ter­pieces of Wood Engrav­ing (2013). He is a mem­ber of the vis­it­ing fac­ul­ty at the Cen­ter for Car­toon Stud­ies and the Dean of the Library and Aca­d­e­m­ic Sup­port Ser­vices at Ply­mouth State Uni­ver­si­ty, New Hamp­shire.